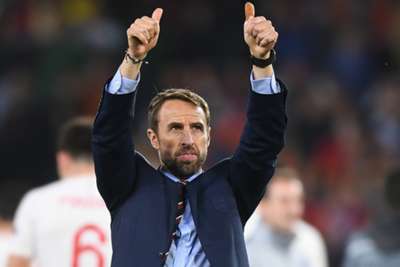 Gareth Southgate thinks the "wonderful bravery" displayed by England against Spain on Monday will help his young players to kick on in their development. A ruthless display in Seville saw the Three Lions claim a 3-2 victory, their first in the Nations League, and end Spain's 15-year unbeaten run at home in competitive internationals. Two goals from Raheem Sterling and a Marcus Rashford strike put England 3-0 up at half-time, marking the first time 2010 world champions Spain have ever conceded three times at home outside of friendly games. Southgate's side held firm under second-half pressure to secure the win, their first in a competitive match since the World Cup quarter-final defeat of Sweden, despite goals from Paco Alcacer and Sergio Ramos. And the manager hopes the players will use the performance as a springboard for the future. "The World Cup was a brilliant experience for us but we had to show signs we could step forward," said Southgate. "With a win against Spain and a draw against Croatia, we have shown we've made progress. It's a big step. "We had a lot of young players out there, and for a team to play the way we did was a great reference point for the future. It's important these youngsters enjoy playing for England and feel the way we want to play, and they should be able to progress from this. "The quality of the performance was great. We played with huge courage. We used the ball with courage. We knew that, to come here and defend for 90 minutes, we were unlikely to get a result, so we needed to be brave with the ball. "We talked about the threat our front three have but they needed to believe in themselves and we needed to get the ball to them. Okay, we ran the risk of losing the ball near our goal when we played passes out of their press, but once we were out we were a huge threat on the counter-attack. The quality and bravery of the play were wonderful." Sterling ended a three-year wait for an international goal with his first-half double, but it was his all-round display that left Southgate thrilled. "I'm delighted for Raheem. I don't think he ever lacked confidence but, sometimes, you get chances and you're thinking too much," he said. "He was prepared to hit things early. His general game was good. He took up some really dangerous pockets of play, turned and ran at the defence. He and Marcus were diligent with their defending, too. We had to do more than our share and being compact without the ball was critical."